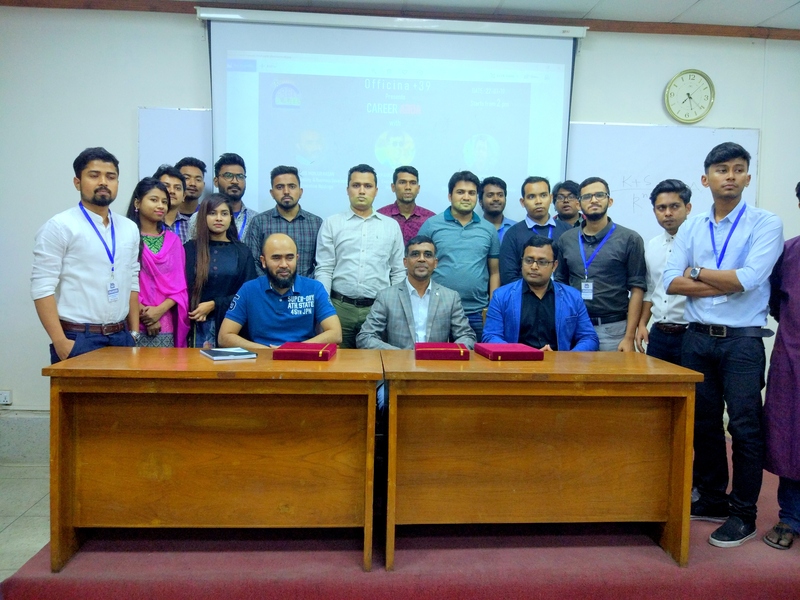 Dhaka (January 22, 2019): BUTEX Career Club(BUTEXCC) organized a knowledge Session titled, “ Career Adda” supported by “Officina+39” under its on-going initiatives to inspire students through personal success stories of experts who are building their own trail with hard-work and innovativeness. On January 22, Tuesday, 2019 “Officina+39” collaborated with BUTEX Career Club to hold a first of its kind interactive session with the students introducing ATM Mahbubul Alam Milton ( Executive Director, Masco Group), Mohammad Monjur Hasan (Director of Marketing Business Development, Meghna Executive Holdings), Engnr. Md. Nasir Ullah (Country Manager, Officina+39 – Fashion and Sustainable Chemicals) were the guest speakers who shared their beneath stories of success toward becoming leader in Textile industries. They inspired the students sharing their experiences on how they decided to follow their passion for growth and making a significant impact on Textile industries of Bangladesh. More than 120 students attended the event and felt motivated as ATM Mahbubul Alam Milton, Mohammad Monjur Hasan, Engnr. Md. Nasir Ullah answered their questions on how to overcome the barriers around to dreaming big. They also discussed on the probable future growth and the bright days ahead of RMG industries of Bangladesh.